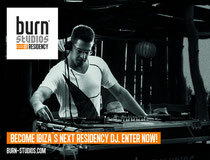 burn studios Residency is offering the chance for someone to showcase their talent by winning a residency spinning the decks for an entire summer in Ibiza. Many people applied for last year’s contest with winners Manu Vulcano, Adam Zasada and Urban Jeram fulfilling their dreams playing residencies in Sankeys, Café Mambo and Privilege respectively. From the local mix-off events, the contest is narrowed down and for 18 entrants the journey continues by attending the IMS in Ibiza, where they will have the chance to meet some of the industry’s key players. Whilst there, they will be enrolled in a hands-on bootcamp with the opportunity to be mentored by some of the most prestigious names in the EDM world; all on hand to deliver their expert guidance to help nurture and advance your talent. Three of the burn studios Residency mentors are Solomun, Steve Lawler and Maceo Plex with more to be announced in the coming weeks! Whether it is production, performance, promotion or image – every angle should be covered. To enter, just supply a mix (max 20 minutes) including at least one track from Beatport’s current Top 100 – submissions are now open via mixcloud.com/burnstudiosresidency. Closing date for entries is 18th March 2013.